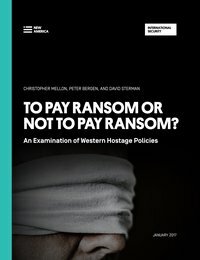 To Pay Ransom or Not to Pay Ransom? In 2014, the world looked on in horror as ISIS murdered its American hostages in Syria. The beheadings were among the most widely followed news stories in recent history; more than nine out of 10 Americans had heard of them by September of 2014. 1 The ISIS cases were the latest in a long history of international hostage-taking incidents. Since 2001—the year of the 9/11 attacks—at least 1,185 Westerners from 32 countries have been taken hostage overseas by terrorist, militant, and pirate groups. Indeed, American hostages have suffered disproportionately bad outcomes compared to other Western hostages. 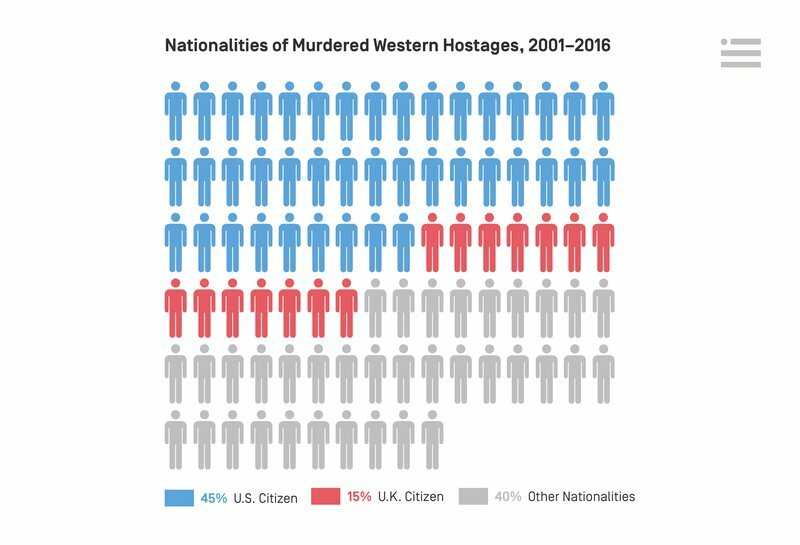 Ninety Western hostages have been murdered since 2001; Americans accounted for around one in five of all Western hostages taken since 2001, but almost half of those who were murdered. A total of 41 Americans were killed by their captors. While these outcomes are likely due in part to the United States’ prominent international role and the target it places on American citizens, the United States’ strict adherence to its no-concessions policy has also contributed to the failure of American efforts to recover hostages. A majority of murdered Western hostages are American or British. Of the 90 Western hostages murdered by their captors between 2001 and 2016, 41 (45 percent) were American and 14 (15 percent) were British. The United Kingdom is the only other country examined that strictly adheres to a no-concessions policy. Citizens of countries that make concessions such as ransom payments do not appear to be kidnapped at disproportionately high rates. There is no clear link between a nation’s ransom policy and the number of its citizens taken hostage. 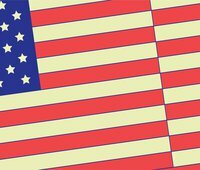 The United States had the most hostages taken since 2001 with 225, followed by Italy with 148, France with 143, and the United Kingdom with 137. Kidnappings are driven primarily by conditions of general instability in countries such as Iraq, Syria and Yemen, rather than by the targeting of particular nationalities. American and British citizens taken hostage by al-Qaeda and ISIS fare worse than continental Europeans taken hostage by these groups. Of the 130 Westerners kidnapped by al-Qaeda and its affiliates, more than three-quarters were freed. Only two of the eight Americans taken by these groups were freed. Three were murdered, one was killed in a U.S. drone strike, one was killed during a rescue attempt, and one remains in captivity. Fifteen Americans were taken hostage by ISIS and its precursor groups.7 Thirteen were murdered, one died in captivity, and one was released. Three of the four British hostages taken by ISIS and its precursor groups were murdered and one remains in captivity. Of the four American hostages taken by ISIS in Syria, three—James Foley, Steven Sotloff, and Peter Kassig—were murdered. One, Kayla Mueller, died in captivity. Of the 16 continental European hostages held by ISIS in Syria, 14 were released. 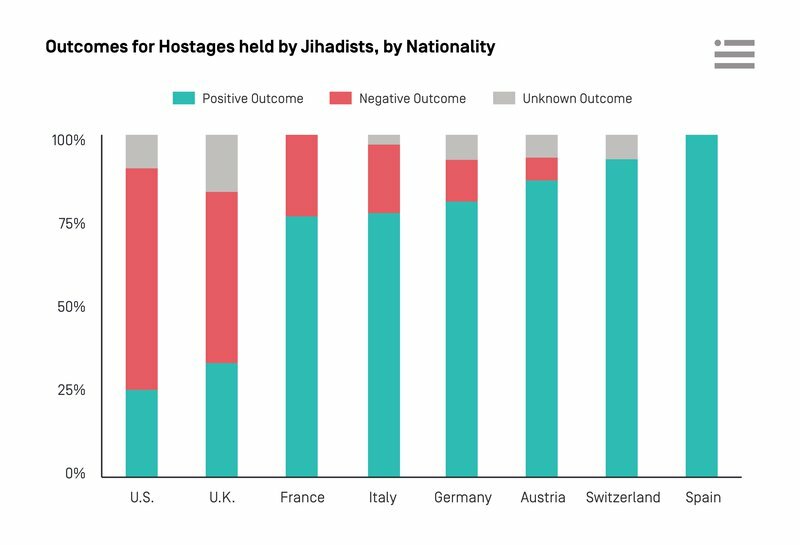 Eight out of 10 EU hostages8 held by jihadist terrorist groups were freed compared to one in four9 for the United States and one in three10 for the United Kingdom. There are at least 14 Western hostages, including six Americans, currently being held by terrorist and militant groups.11 Seven of the 14 are being held by the Taliban-affiliated Haqqani network. Of the remaining seven Western hostages, three are held by Al-Qaeda in the Islamic Maghreb (North Africa), two by Abu Sayyaf in the Philippines, one by ISIS, and one by an unknown group in Yemen. Five of the Americans are being held by the Haqqanis and one is held by Al-Qaeda in the Islamic Maghreb. The French government’s efforts to move toward a no-concessions policy in 2010 led to an increase in hostage deaths. Twelve of the 16 French hostage deaths in our database occurred after the attempted rescue in 2010 of Michel Germaneau, an aid worker held by Al-Qaeda in the Islamic Maghreb in Niger. President Nicolas Sarkozy identified the raid as marking a “major turning point,” after which France resolved to be tougher on kidnappers by making fewer ransom payments and attempting more rescues. These deaths include that of Germaneau, who was murdered after the failed raid. Four other hostages were either killed during rescue attempts or murdered in reprisal for attempted or threatened raids. It should be noted that the French did not cease to pay ransoms altogether; for instance, they made payments to ISIS in 2014. Since a new U.S. hostage policy was announced in the summer of 2015, which focused on better coordination across the government to secure the release of hostages and better U.S. government communications with the families of hostages, at least six American hostages have been released and one has died in captivity. However, none of these publicly identified hostages that were released were held by jihadist terrorist groups. Two were held by unidentified, probably criminal, groups in Nigeria and four were held by the Houthis, a Shia militia that now controls much of Yemen. U.S. citizen John Hamen was held by the Houthis and died under mysterious circumstances in November 2015. It is possible that he was the first American hostage deliberately killed by his captors since the 2015 policy reforms. The Hostage Recovery Fusion Cell, an interagency coordinating unit of the U.S. government, says that since its establishment in 2015 it has overseen the release of approximately 100 hostages, a quarter of whom were held by terrorist groups.13 The Fusion Cell has not provided any details on these cases, and it is unclear if any of these released hostages were held by jihadist terrorist groups. 5 If we exclude the cases with unknown outcomes we find that 28 percent of American hostages were killed or remain in captivity, compared to an international average of 12 percent. 7 Jama’at al-Tawhid wal-Jihad, Mujahideen Shura Council, AQI and other Zarqawi-affiliated groups that merged to become ISIS. 11 American journalist Austin Tice, missing in Syria since 2012, is included in the database, but is not listed here because there has been no public proof of life within the last six months.